Joe Clifford has always been an author who had a way of allowing the reader to connect with his characters, to see events through their eyes and understand what drove them to do the things they did. But in this book he takes this experience to a whole new level. 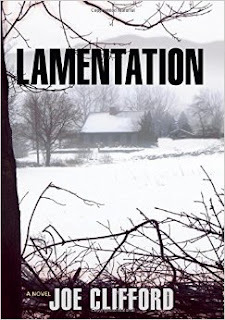 The aspect of Lamentation I enjoyed the most is the manner in which he explores the innate emotions we experience as we grow older and grow more, or in some cases, less connected to our family circle. This book does an excellent job probing what it means to be family, how people experience and deal with the conflict of feeling responsible for the failings of family members, yet try to pull away and separate ourselves from the heartache that comes from watching a family member spiral into a self-destructive lifestyle. The main character, Joe Porter, also struggles to come to terms with becoming a full time parent and what that means, both time spent with your child and also the responsibility that brings. He struggles with the burden of living up to the expectations that come with having had parental role models who set the bar high and his uncertainty of being able to achieve that standard, a battle he rages not only for his son, but for the legacy that he hopes to carry on from his own parents. Clifford’s writing allows the reader to connect with his character because most people fight the same battles as his characters, albeit perhaps in a different station in their lives. Good writers allow you to understand characters, but great writers allow you to be the character and that is what happens as you read this fine piece of writing. The story is engaging and excellent on many levels. I think this book will bring a whole new range of readers to Clifford’s works and it is well deserved. This novel shows that Clifford is only getting better in his ability to craft a story that is engaging for its plot but also multilayered in its character development. I loved this book and could not give it a stronger recommendation!